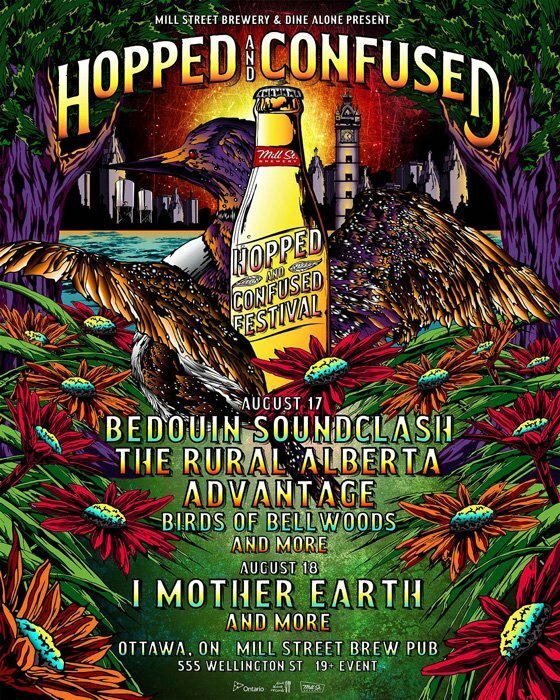 After bringing the Trews, Yukon Blonde, Tokyo Police Club, Hollerado and more to Canada's capital last summer, Dine Alone Records and Mill Street Brewery have lifted the curtain on the lineup for their third annual Hopped and Confused event. Set to take place August 17 and 18 at Mill Street's Ottawa brewpub, the event will feature Canadian alt-rock vets I Mother Earth and Bedouin Soundclash, along with Birds of Bellwoods and the Rural Alberta Advantage. Four additional acts have yet to be announced. Limited two-day passes are currently on sale for $45, and can be purchased here until 12 p.m. on July 18. After that, they'll be available for $60, while single-day passes can be had for $35. Find a complete breakdown of the event's lineup below.